GitHub - WinVector/sigr: Concise formatting of significances in R (GPL3 license). Want to be notified of new releases in WinVector/sigr? Concise formatting of significances in R (GPL3 license). Please see Adding polished significance summaries to papers using R for some discussion. Used to render the support material for Proofing statistics in papers. 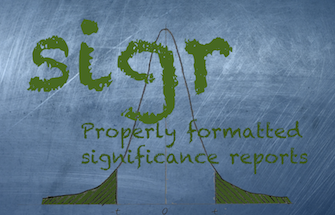 sigr is a small package that concentrates on computing summary statistics and reporting in an appropriate format. For example here is formatting the quality of a logistic regression. Chi-Square Test summary: pseudo-R2=0.02282 (χ2(1,N=8)=0.2531, p=0.6149).